Ther. Thursday, Jan. 5, 1888 Wea. A storm thro' day & eve of both rain & snow. 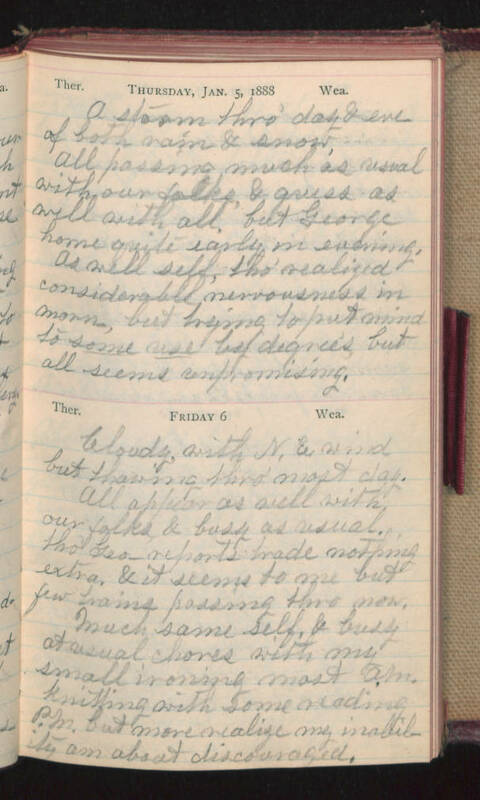 All passing much as usual with our folks & guess as well with all, but George home quite early in evening. As well self, tho' realized considerable nervousness in morn, but trying to put mind to some use by degrees but all seems unpromising. Ther. Friday 6 Wea. Cloudy, with N.E. wind but thawing thro' most day. All appear as well with our folks & busy as usual. Tho' Geo_ reports made nothing extra, & it seems to me but few trains passing thro now. Much same self & busy at usual chores with my small ironing most A.M. Knitting with some reading P.M. but more realize my inability, am about discouraged.